99doing provides an email signup in addition to a Facebook login. Once you sign in, you can choose to be a part of ‘Talentsphere’ and be notified of auditions. When it comes to movies, my only talent is to watch them, so I let that go. A Facebook login enables connecting with friends already on the platform and know what movies they’re watching, which celebrities they are following, including reviews posted by them. After creating a profile, one can also find and follow new friends on the network. The home page (as shown in the screenshot above) lists movies in order of the currently running movies and the upcoming ones. You can add it to your watchlist or give a 5-star rating if you have watched the movie. Clicking on the movie gives detailed information in terms of plot, cast and crew, trailers and songs. Currently, the list include Kannada, Tamil, Telugu, Hindi, English and Bengali movies only. Additionally, 99doing is like a meeting place for talented people and the people looking out for them. If you are looking to be a part of movies as a cast or crew, or you are hunting for aspiring talent, then ‘TalentSphere’ is the place for you. 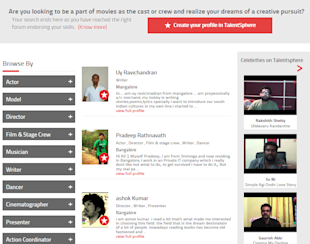 You can browse through various talent ranging from actor, writer, musician, dancer, cinematographer, etc. Every category is further divided into sub-categories; for instance, under ‘writer ‘, you can search writers for script, screenplay, dialogues, lyrics, etc. ‘Auditions & jobs’, as the name suggests, lists the various vacancies in upcoming film projects. Currently, one can view and apply for positions in Nirantara creations. Also, under businesses it lists casting agencies and training institutes that will be useful for the aspiring talent. For movie buffs alone, there are dedicated social movie discovery platforms we had reviewed earlier like Rinema, FlixStreet and The Review Monk. But, you wouldn’t find such an extensive collection of Kannada, Tamil, Telugu, Bengali movies as you can in 99doing.